It was time to get away for a short weekend bike adventure. It had been more than a year since the last overnight bike trip, and since then we had acquired a few new bits of gear that needed to be put to the test. 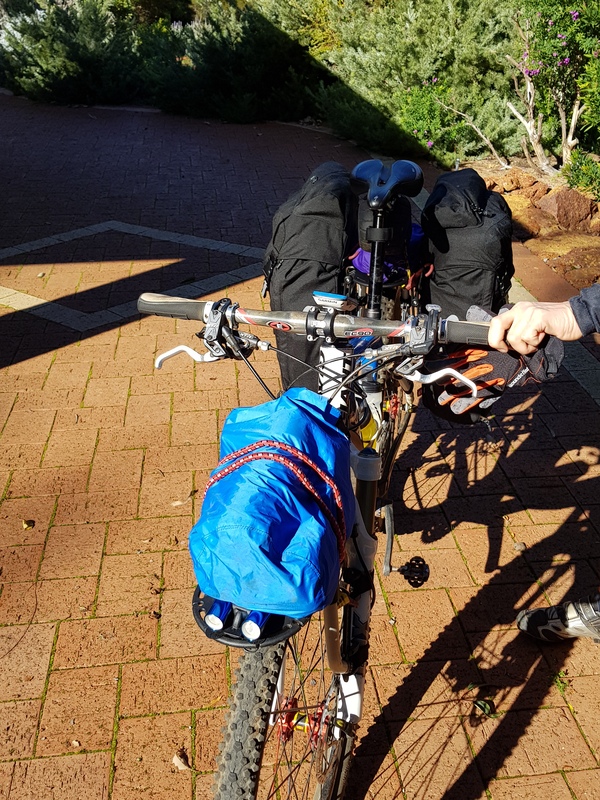 We decided to do a trip in the local Perth hills area, which was the most time- and cost-effective option. Lake Leschenaultia was the closest easiest target! Annie and I packed up our panniers and loaded them on the bike. Each of us had two sleeping mats, plus we had a double sleeping bag, an extra sleeping bag to go underneath, and camp pillows. Quite a lot of luggage for two days, particularly considering we didn’t take any meals! We were joined for the ride out by Karen, who set a quick pace – as she wasn’t weighed down by 15kg of luggage! It was a straightforward ride out on the Heritage Trail from Darlington, down to Midland, then back up the northern side of the trail to Chidlow. We had the obligatory stop at Bay Tree Cafe in Chidlow, where Karen had a snack to fuel her ride home, and Annie and I enjoyed a rest. Onwards to the lake … after leaving Darlington at 12pm, we arrived nice and early at the lake after our speedy 35km ride (average 16km/hr). Time to set up the tent – did you bring the instructions? No? What do I do with these poles? Luckily the tent was a lot easier to put up than we remembered, and it was very quickly and easily assembled. Then in with the sleeping gear – it looked so comfy! This is glamping by bike! We took the luggage off our bikes and took the chance to do a sneaky preview of the Panther Trophy off-road time trial course (race day is in late August). It will be a fast run this year! The trails have been graded and are not as rutted as previous years. Definitely suitable for the cyclocross bike! On the way back to camp, we admired the serenity of Lake Leschenaultia. It was so calm! Idyllic weather conditions for riding. Then time for a hot shower (glamping again!) and change into our civvies for the short ride back to Chidlow Pub for dinner. We set some new fashion trends at the pub! We enjoyed some beers and very good food at the pub, and were back at camp for an early night. In spite of our early night, we didn’t sleep well. It turns out that camping by a fresh water body is not the best idea – who knew that bird life would be so noisy throughout the whole night! Oh and it was a full moon, which is very bright from inside a tent. Note to self: must pack an eye mask. At least our lovely Enlightened Equipment double-quilt kept us nice and warm. Although it did get significantly colder about 2am (sub-10 degrees) which required a few layers to go back on. We were up with the sun not long after 7am, then it was about an hour to pack up camp, get changed, and pack the bikes. Then off to the lovely Bay Tree Cafe for breakfast – they have a good weekend breakfast menu, delicious baked goods, and great coffee. After letting our breakfast and two coffees settle down, we were finally onto the bikes at about 10:45am. We took a different route home – longer, more interesting and more challenging. 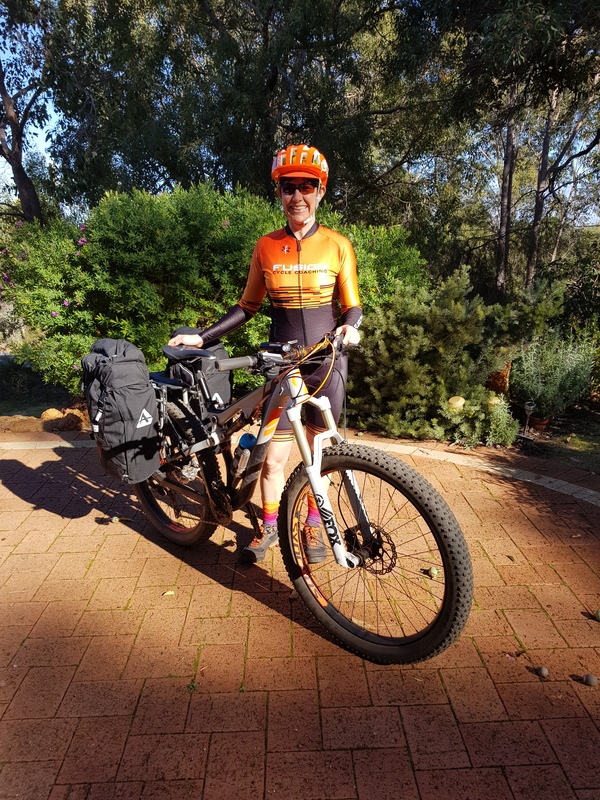 It was 55km on the way back, heading south from Chidlow to Mundaring Weir, then west alongside the weir, before taking the Munda Biddi route up Mundaring Weir Rd to rejoin the Heritage Trail. Although I had my mountain bike, I was pleased to see that the course was cyclocross-bike-friendly. However, there was one climb that was too steep on the mountain bike with panniers – estimated gradient 20%. It was so hard even walking up there with 30kg of bike plus luggage! When we reached Mundaring Weir Rd, we stopped at a campground for a rest and snack. Mmmm I’m so pleased I got that plum danish from the bakery! Thankfully, the Munda Biddi trail was not too steep, and the heritage trail was mostly downhill on the way home. It was just under 4 hours of riding on Day 2, but it was one of the longest days I’ve had on the bike in recent months! Tagged bike camping, micro-adventure, off-road.